Before we begin to focus on ULD storage, it is useful to spend some time thinking about storage in general. For instance, what would be your expected standard of storage and neatness if you were to go into the kitchen of a restaurant where you were having dinner? You would most probably expect everything to be neat and tidy, with pots and pans in their allocated locations, crockery and cutlery neatly positioned, and everything in good order. What about a garage/auto-shop you are taking your car to for servicing? You may not feel particularly comfortable if there were tools and spare parts spread all over the floor, and everything was in a general state of disorder. Why, then, should it be any different for ULD storage? What is it that makes the industry seem to accept that it is unnecessary to pay much attention to properly storing containers, pallets, nets, straps, and other ULD accessories? 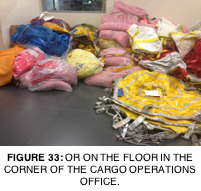 This certainly does not have to be the case, and there are numerous airports and facilities that have managed to use sufficient discipline and establish facilities and systems to ensure that everything is stored neatly and tidily. Unfortunately, at the other end of the spectrum are many facilities with an almost complete disregard for the wellbeing of ULD when stored. In this chapter, we will examine the basic principles of ULD storage. None of these concepts require a background in physics to understand, as ULD storage is instead about the application of a few very basic principles. When these principles are applied, they greatly reduce the likelihood of damage to the ULD, but, when they are ignored, the likelihood of damage to the ULD significantly increases. ULD storage systems can range from simple single-level racking with manual operation, to highly-automated multi-storey systems. These two ends of the spectrum appear very different, but both embody the same basic principles of ULD storage, which we will explore in detail in this chapter. 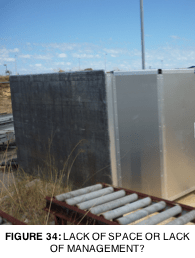 The situation has also become more complex with the increasing use of ULD in service provider terminals, ULD storage areas, and even in freight forwarders, whose facilities may be a long way from the airport. And, ULD storage is not just about the containers or the pallet. Suitable storage for nets, straps and other ULD accessory items is also important. 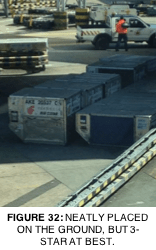 A common industry-wide response to the question of why a particular ULD storage system is not up to standard is, “If we could just get more space, then we could have great ULD storage.” Space comes at a premium at most airports, so it’s not surprising to hear such a remark. However, this reasoning completely misses the point, because there is no justification for putting ULD at risk of damage through inadequate storage. 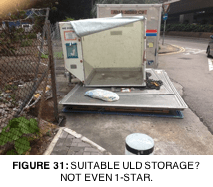 Although space may be tight, the fact that ULD storage ends up at the bottom of the list is often more to do with airline priorities and budgets than with actual physical limitations. 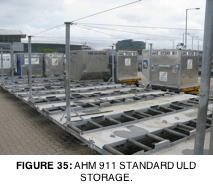 Airport authorities are obviously one of the key players in this regard, since they are capable of allocating sufficient and suitable in-airport storage areas for ULD, which their appointed service providers can use to set up ULD storage facilities. There many airports where quality facilities can be found, but unfortunately, there are others where they cannot. Cargo terminals really have no excuse for shortcomings when it comes to proper ULD storage. Cargo operations lie at the core of their business, and without ULD, their business model would be completely different. As such, there is surely a very strong case for creating optimal ULD storage facilities, whatever their operating space limitations may be. 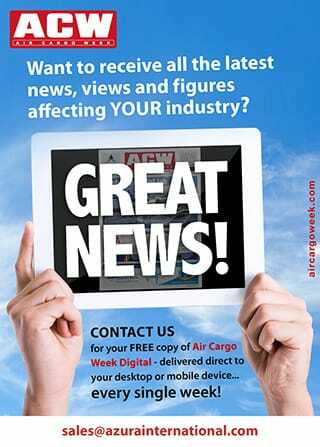 Similarly, freight forwarding facilities have no valid excuse for unsatisfactory ULD storage. Certainly, such facilities may be tight on available space, but that does not warrant ULD storage being compromised. If you were to collect your car from a mechanic only to find that there was a big scrape along one side due to workshop mishandling “because we were a bit crowded”, you would certainly be unimpressed. The same logic applies to operations with ULD! All containers and pallets are designed with a base structure that requires a particular degree of support at the underside when being loaded and moved. In early ULD operations, many containers were equipped with forkliftable bases, which provide greater structural strength. 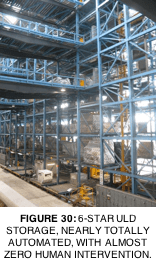 These days, such containers are relatively uncommon, and for the purposes of this discussion, we will assume that we are dealing with the storage of non-forkliftable base containers.